Project Overview: Children met for a holiday craft and lunch before an afternoon spent swimming in an indoor pool. Rationale: Children benefit from the physical exercise provided by swimming, especially during the cold, winter months when their outdoor activity is limited. Description: The children met at the Keystone Blind Association for a holiday party. 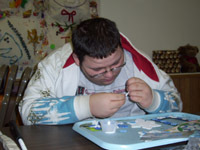 Each child completed a holiday themed craft activity (link to page with suggested craft activities). A tray was provided that contained all of the materials for the craft. Students could identify the individual pieces and construct their craft tactually. The resulting project had tactile attributes for the students to explore. Volunteers assisted the children as needed during this activity. After the craft lunch was provided, buffet style. Students lined up for the buffet and served themselves with assistance as needed. Appropriate dining etiquette was practiced during the meal, with students feeding themselves independently. Following lunch, gifts were given out to the kids. These gifts included a Keystone Kids gift from the blind association, a special “Secret Santa” gift from a staff member, and treat bags provided by a local service club. Afterwards, the group traveled to a local indoor pool. Students changed into their swimwear independently in the locker rooms. In the pool they enjoyed swimming, playing with pool floats, and socializing with their peers. Locate an indoor pool for your group to use. Suggested places to contact include local high schools, fitness clubs, and community centers. Find out if they will provide a lifeguard. Agree on a fee for the event. Will your group have private access to the pool, or is it open to the public during the event. Inquire about locker rooms/changing facilities. What is the size and depth of the pool? Is there a shallow area for younger children? Are floatation devices provided? Plan your meal. For the holiday dinner, we like to have a traditional meal such as turkey or ham, mashed potatoes, green bean casserole, rolls, salad, punch, and pie for dessert. You can have all or part of your meal catered. Usually we do a combination: we’ll order the turkey, mashed potatoes, rolls, and pies from a local grocery store and make the rest up ourselves that morning. For a group of 10 children and 6 adults, the following amounts of food should be adequate: 5 lb sliced turkey breast, 5 lb mashed potatoes, 2-3 pies, 2 dozen rolls, 1 stick of butter, 9X12 pan of green bean casserole (6 cans beans, 3 can mushroom soup, 1 large can of French fried onions), 2 bags of salad mix plus dressing, 2 cans of cranberry sauce, 3 2-liters of lemon lime soda plus 2 lime sherbets for punch. Choose a craft activity. You can find a lot of ideas for holiday crafts online. It is important to choose something that will be meaningful for all the children, even those who are completely blind. For example, making a 3 dimensional Christmas tree and decorating it is better than having them draw or decorate one on paper. Following are just a few ideas and suggestions. Mini Christmas Tree: cover a Styrofoam cone with green felt. Decorate the tree with various items such as buttons, beads, pom poms, pipe cleaners (can be wrapped around like tinsel, or cut and bent into candy canes). Depending on the age of the children, you can use straight pins to attach decorations to the tree. Glue dots or tacky glue also work well. Snow Men: Using 2-3 different size Styrofoam balls have students build snowmen. Glue a piece of batting to the bottom ball to hold snowman upright. Sticks can be stuck in for arms, a strip of fleece or felt cut for a scarf, a baby sock as a stocking cap, and various buttons, beads and pom poms can be added for embellishment. You may want to put glue on the balls and roll them in white glitter first for a glistening look. >Snow Flakes: show the children how to fold the paper and make cuts for snow flakes. White glitter and a string for hanging can be added. Decide if you will have gifts for the children. Keystone Kids gifts: Children at they Keystone Blind Association always receive a special Keystone Kids gift at Christmas. Past gifts have included: hoodies with their names embroidered on them, gym bags, fleece blankets, Pajamas, and hats & scarves. These items always have “Keystone Kids” embroidered or screen printed on them. Secret Santa gifts: employees at the Keystone Blind Association have the opportunity to sponsor a child at Christmas. Children make “wish lists” during the November event. These wish lists are then attached to ornaments with the children’s names on them. Staff members select a child, purchase & wrap a gift ($10-$15 limit), and attach the child’s ornament as a gift tag. Treat Bags: Contact a local service agency such as the Lions’ Club, Rotary, or church groups to see if they are interested in donating treat bags.